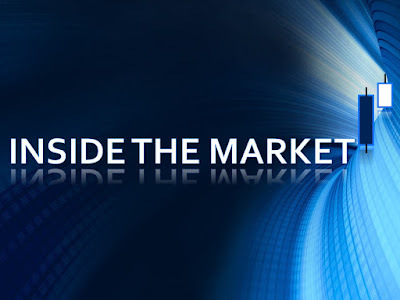 Inside The Market: Estimate of the cost of debt. to value the risk of a stock, indirectly. And on that note, we can analyze the main calculation methods. I. The cost of debt : the accounting method. The accounting method is based on balance sheet data. It is easy to estimate but it is also quite prone to errors. It means that if on one hand, the data are readly available, on the other the result is purely static because it doens't consider the perspective scenarios. Indeed, it is advisable to integrate the method with a perspective business plan, focused on the financial structure of the target firm. According to this method, the cost of debt is equal to the financial expenses divided by the financial debt. There are two options : the first one considers the gross debt minus the cash and cash equivalents (it means that the debt can be paid by the cash ; this hypothesis is not always true) ; the second one considers the gross debt and the interest expenses (this hypothesis is more prudential). Here we have an example ; the company is Amplifon S.p.A. We can notice the two options. The accounting data are the fiscal years 2017 and 2016. As shown in the table, the cost of debt is equal to 7,41% if we consider the net debt and it is equal to 4,63% if we consider the gross debt. An important note : the interest expenses are divided by the average debt with the aim to make comparable the two quantities, the item of the income statement ("flow quantity") and the item of the balance sheet ("stock quantity"). Another option of the accounting method is the following : we can also consider an average figure of the cost of debt on several years (3-5 years). 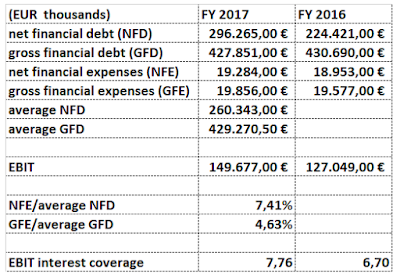 In the same way, we can build a perspective table with the estimated financial debt and interest expenses (the next 3-5 years at the place of the past ones). II. 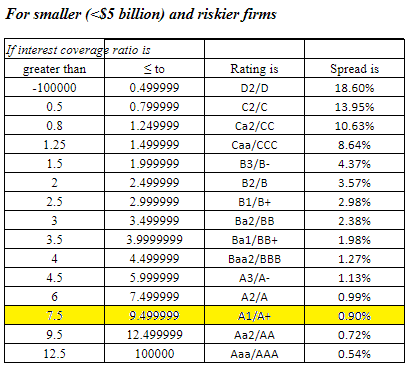 The cost of debt : the relation between the interest coverage ratio and ratings (the fundamental analysis drivers). We can link the interest coverage ratio (= EBIT/net financial expenses) to the ratings of a sample. For example, the professor A. Damodaran (see the link,--> Ratings, Spreads and Interest Coverage Ratios, http://pages.stern.nyu.edu/~adamodar/) has built a sample with the rated companies in United States. There are two tables : for large, for smaller and riskier companies (the proxy of the size is the market cap). With the current exchange rate and with the current m. cap, Amplifon belongs to the second group (https://www.investing.com/currencies/eur-usd). As I said, the sample consists of US companies. For a more appropriate sample, of course, it is advisable to use European companies and rate of returns of government bonds, similarly. Finally, we must remember that the spread that we add to a base rate can be determined by other fundamental ratios (the interest coverage ratio is just one of the drivers). In this way, the discussed methodology is a part of the framework based on the fundamental analysis. III. The cost of debt : the listed bonds. The last method is among the most reliable and the easiest to apply methods. If we have a firm with listed bonds, the cost of debt is equal to the rate of return of the mentioned bonds (-->yield to maturity, YTM). Alternatively, we can take as a benchmark a panel of similar listed bonds. For Amplifon, we can consider the bond listed on the Luxembourg Stock Exchange (LuxSE). See the following link : https://www.bourse.lu/security/XS0953207759/200201.